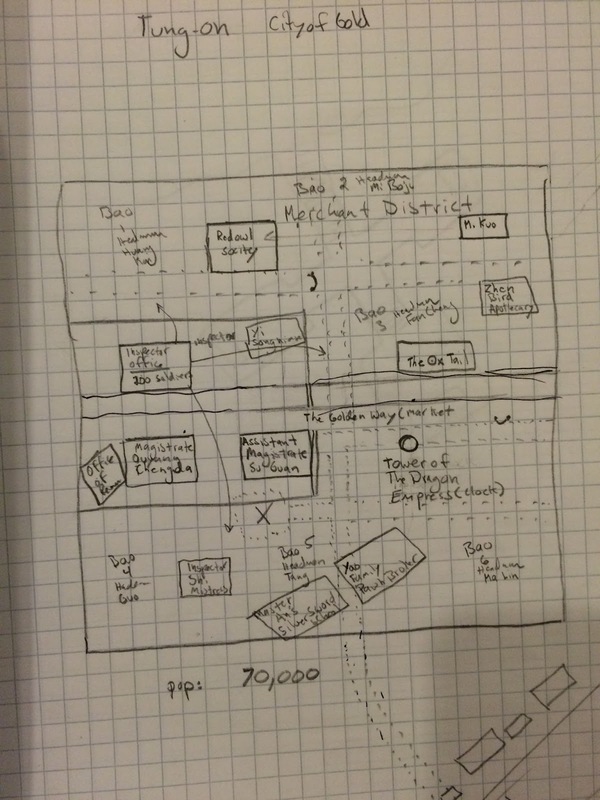 This is series on the Bedrock Blog where I will be posting campaign notes from my binder. These are all posted as they appear, raw. So they will get messy at times. The purpose is just to show I run some of our games. Keep in mind that while this appears here as one continues entry, these are taken from different sections of my binder that are relevant to the adventure or events in question. I did occasionally include parenthetical notes explaining terms that make no sense without context for the blog. Here is one I did recently in a Wandering Heroes of Ogre Gate campaign. 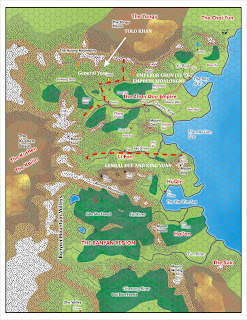 Forgive the quality of the maps, Except for the Qi Xien map these are my personal hand drawn area maps for the campaign. 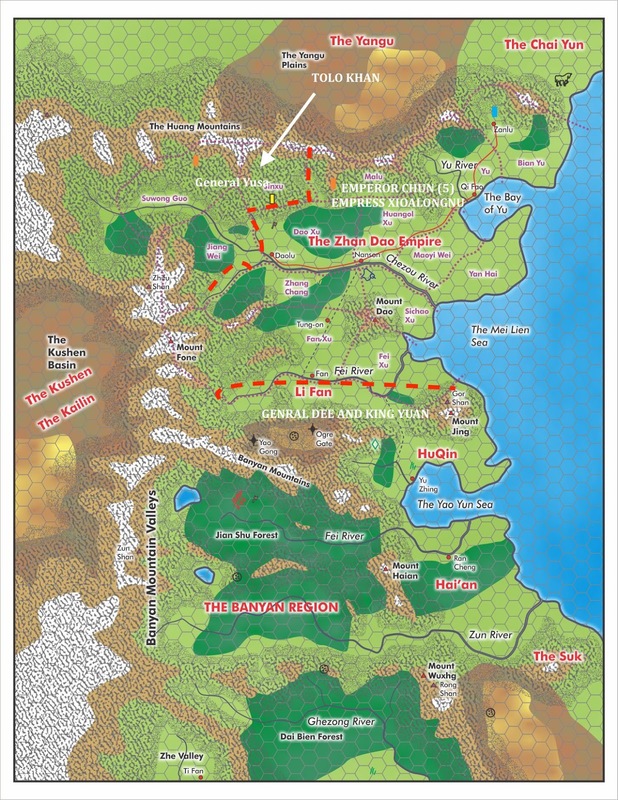 This is an adventure for my Profound Masters Level Campaign: Demons of Celestial Heart Sect. You can read the session log HERE. You may see a number of differences between the campaign log and the adventure notes. Most of these I altered right before the session into my actual notebook (marked up with pen). However I believe in one or two cases, I realized there was a potential consistency issue with the material I had written down and changed it right before it occurred in play. Generally I try to avoid that, but if something looks wrong on the page I adjust. It is also worth noting that this occurs in my own campaign, two years after the date presented in the core rulebook. The Glorious Emperor was assassinated in the previous campaign and the dowager Empress has taken control of the empire. A little over a year ago, Magistrate Ouyang Chengda married a beautiful woman from Li Fan named Shanhu. Though a skilled martial she adjusted to life in Tung-on quickly and became popular in the city. Eight and a half months after they met, she gave birth to a boy, Shengwen, but died an hour later. The city mourned her and she was buried in a tomb on the outskirts. In truth Luo Shanhu was the former wife of Marauding Dragon (leader of the Seven Blood Cave Alliance and chief of Marauding Plague Sect). She was pregnant with Marauding Dragon’s child and fled because she feared he would kill it as she believed he had done with his previous wife and child. She tried to escape from the sect and lead a normal life in Tung-on, where she met Chengda. While some suspected the child was not Chengda’s the magistrate believed the child to be his own and adored him. He also grieved for his wife and honored her memory by building her a large tomb just outside of the city. But Marauding Dragon had been looking for his wife and child for some time. When he learned they were in Tung-on, he sent five bird demons to find and retrieve them. One month ago the Bird Demons came to the city and began looking for the pair. To hide themselves from hunters, they placed a demon stone in the sewers (this throws off devices that can detect demons). They learned identified potential households that Shanhu might have joined and infiltrated them. Last week The Blue Kingfisher demon killed Master Kuo, a local merchant and prestigious member of the community. Celestial Heart Sect was alerted to the presence of Demons in Tung-On by Headman Ma Lin (an old Friend of Long Winded Master). He was particularly concerned that the demons in the city had plans against Magistrate Ouyang Chengda (whose wife died from what he believed to be some sort of curse). He reported three deaths in the streets (all victims missing their hearts) and the death of Lady Shanhu. This isn’t just a market, it is a massive meeting ground for emporiums to trade and where merchants sell large quantities at the center of the canal system. This is a rowdy Inn and Restaurant. They are famous for their Fiery Pork Noodle and their Braised Pork. The place is operated by Zhang Yuying and her son Boqin. She desperately wants to find a wife for her son, who is hopelessly obsessed with becoming a great martial hero (he has little aptitude, though he is cunning). Therefore she has exclusively contracted with female performers, fortune tellers and other staff for the inn. The Pipa player, Dongmei, has taken an interest in Boqin but he is much too shy to respond and too naïve to notice. Food Items: Fiery Pork Noodle Bowl (25 spades), Roasted Prawns (15 Spades), Duck Eggs (8 Spades), Pork Buns (5 Spades), Braised Pork (60 Spades), Braised Chicken (30 Spades). 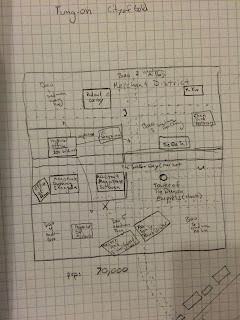 Rooms: Normal Room (100 Spades), Smaller Room (30 Spades), Luxury Accomodations (500 Spades). Services: Pipa Player, Dongmei (5 Spades a Song); Fortune Teller, Ruolan (20 Spades per reading). Empress Xioalongu has effectively taken control of the Empire and become obsessed with time. She has also developed an interest in public relations and had the Tower of the Dragon Empress erected here. It is a massive water clock where her arms rise as the day progresses, and lower as the night falls. Each hour a loud series of bells chime and an announcer takes to a platform atop the statue to state the present hour. This is an organization of black market merchants. They do have their eye on the Sword of Time but they haven’t attempted to take it (offiicals are generally considered off-limits by the group). They have been bribing Assistant Inspector Pan and they can be a source of general information. The chief of Red Own Society is Mu Qingzhao, including that Magisrate Ouyang’s wife was really a demoness. This is operated by Physician Sima Hao. He sells mostly cures and offers his services for curing ailments. He is also knowledgeable about demons. There have already been three attacks before the players get word of problems in Tung-On. A Yen-Li priest named Meng was killed 10 days prior in the Golden Way Market. A young woman named Chayun was killed in the room of the Ox Tail Inn. An old man named Daibo (servant of Headman Ma Lin) was found just outside the city 4 days prior. Ma Lin sends message with pigeon to Long Wind (who received it just before being killed). Headman Ma Lin was found dead near the tower of the Dragon Empress at precisely the hour of the Phoenix. He was killed by Brown Owl. His heart had been plucked out. Witness is Di Yaozu, a beggar who was driven crazy by the sight. He is staring off and muttering something about an owl and death. Headman Lin had paid him 200 spades to go to the Tombs with him. He can take them to the Tomb that Headman Lin approached and inspected. He seemed like he was going to go into it, but decided against doing so and returned to the city. As they passed the Tower of the Dragon Empress a creature attacked them. The creature looked across between a dragon and an owl. Wife (Noot) said he had been to the outskirts of the city the previous evening. He had sent a message to Long-Winded Master informing him of the situation by carrier pidgeon. Mister Kuo is a wheat merchant and land owner. One of the richest men in Tung-on. His wife, Lien, recently had a baby girl (Da). Mister Kuo was found murdered in his bedroom. He had been visibly beaten and raked with claws then left for dead. This was the work of Blue Kingfisher. The Book “Spirited Beasts from Between the Mountains”. The book is a bloody mess and has entries on every known type of demon. The household servants were a sleep but his wife and child were present in the next room. The wife witnessed him. According to his wife, Lien, she ran into the bedroom when she heard the sounds of an attack. She got there and found her husband dying on the ground. The entire three halls of their living quarters were ransacked. She found their daughter, Da, unharmed in the next room. Nothing was missing. Cause of death was blood loss from having his throat slashed by claws. Mister Kuo has a collection of old swords in one of the halls, and recently sold one to Magistrate Chengda (mainly to help secure support from the most prominent official in town). The sword he sold was The Sword of Time (this is known to the Red Owl Society). He had originally purchased it from the Yao Family Pawnbroker. According to servants the noises and disturbance occurred at the hour of the Phoenix. The Assistant Supervisor (Huang Kan) was found knocked out in the hall of records. He heard a hooting then saw blackness and woke up hours later. The Civil Registration Records (births, marriages, deaths, etc) for the past 12 months were missing. There is a sewer system below the city, with two main intersecting tunnels that connect to many smaller passageways. There is a demon stone placed down here to impede attempts at detection. The civil registration records of the past twelve months are here. Their area is clearly lived in. They also have several lacquered boxes with diced up hearts in them. In addition they have a bronze cylinder that contains Feast Beetles. These shiny blue beetles come from the northern mountains and burrow into human flesh until they reach the heart. Once there they are the cause of Ice of the Heart (See POISONS AND DISEASES in CHAPTER TWO). They move in clusters and swarm opponents when they can. Burrow and Poison: If a Northen Feast Beetle bites its target, it begins to burrow, reaching the heart in 5 rounds. Before that time it can be extracted with a successful Medicine Roll, but this causes 1 wound per round the creature has burrowed. Once it is in the heart it causes Ice of the Heart (See POISONS AND DISEASES in CHAPTER TWO). Ice of the Heart: This disease is caused by an excess of cold in the heart. It is most commonly the result of the northern feast beetle, which is parasitic and burrows into the human body until it reaches the heart. Once there, it waits until the person consumes water. As soon as water is consumed the beetle draws it into the heart and releases a terrible poison throughout the system that cause the body to literally freeze. When this occurs the person’s limbs become stiff like ice and they die within minutes. The beetle then consumes the frozen flesh slowly over the course of months. Crocodiles are short limbed, water-dwelling reptiles with narrow bodies that blend with their surroundings. Their long snouts are filled with sharp teeth, and their powerful jaws make them one of the most feared predators in the rivers Qi Xien. Beast Strength (x2): Crocodiles are very strong. Their Base Lift is doubled, and they can exceed capping limits on Damage Rolls. If anyone enters the tomb she goes to the ceiling ad remains there, attacking with surprise if she can. She is wearing a Dragon Coin Talisman. This is a coin with the symbol of a dragon and the Seven Blood Cave Alliance on it. It glows somewhat in the darkness. Epitaph: Lady Shanhu married Ouyang Chengda and proved a dutiful wife and gave him a child. She was popular with the people of Tung-on and a skilled Kung Fu Expert. However she put away her sword on her wedding night, vowing only to raise it in defense of the city or her family. She died in childbirth. Shanhu is a Phoenix Ghost, something created when a person’s spirit is unnaturally divided and one or more of their phoenix essences remain. This was caused by the Dragon Coin Talisman around her neck which absorbed her dragon spirit, leaving her body as Phoenix Ghost. She is anchored to the tomb. Shanhu is dressed in white robes and her white hair is in a double bun. Her teeth are tallow and her mouth is too wide. She is stronger than most phoenix ghosts, due to the talisman. She must stay frozen in her coffin, until people are within three hundred feet. This awakens her. She is driven purely by anger when awakened. Bite and Feast: A Phoenix Ghost must drink human blood to drive away the cold or it will freeze. When it bites a target and does damage, it inflicts 2d10 Open Damage and drains 1 points of Hardiness (that comes back at a rate of 1 point per day). Phoenix Spirit Disruption Breath: Roll against Evade for a single target. A person struck and is afflicted with the Missing or Disrupted Phoenix Spirit Flaw for one day (the player should take the “Disrupted” aspect of the flaw, not the “Missing” aspect). See MISSING OR DISRUPTED PHOENIX SPIRIT in CHAPTER ONE for more information. Bite can also do this, while causing 4d10 open damage. Chilling Breath: Roll against Evade for all targets in 100 feet. Chilling black smoke eners their bodies and the cold causes 4d10 damage plus 2 extra wounds. Check for these regularly. After each attack occurs roll again. This determines when the next one happens. So if the first happens in the Hour of the Horse, then you roll and the next one occurs in the Hour of the Butterfly, nearly a full day elapses between those attack. Each hour varies in length from 80 to 120 minutes, with thirteen over the course of each day. The Dragon Hour is the first hour and begins at midnight. These are randomly determined. Some are planned in advance by the demons, so the general events will remain the same as described in the text. But the GM should adjust and alter them as he or she sees fit according to the particulars of the outcomes (for example if Brown Owl is involved in an attack, perhaps the GM decides he is more cautious than the others and ducks into an apothecary shop first instead of going straight for the sewer entrance). These murders are products of the demons feeding and trying to heal. Anytime they occur the victims are randomly selected using the table below. They all occur in the same hour (potentially even at the same precise time as the demons enjoy harrowing the population and like to coordinate attacks). Each victim has had its heart pecked and eaten out, then left to bleed in the street. There is a 10% chance that each murder was witnessed. Most witnesses can describe a massive creature with a long mouth or beak. However they tend to embellish and add extra details. 4 A witness saw the demon talking to someone in an alley (could not see person), but the person was a man and asked if they’d found her yet. 5 A witness saw the demon talking to someone in an alley. He reprimanded the demon for letting hunger get the best of him. Also asked for news on the child. 8 Witness saw the demon speaking with a rodent in the alley (witness is a drunk). The rodent, probably a rat, was told to go to The Hanging Valley of the Dead with the news. 9 A witness saw the demon, followed it to and witness it scoping out the grounds near Magistrate Ouyang Chengda’s house. Also he thinks there are Demon Hunters, but they paced a Demon Hiding Stone in the city to obscure their whereabouts. 10 A witness saw the demon speaking with a strange looking man with wild hair (Bai Zhun). Said that the child is at Magistrate Chengda’s (if already happened just explains the child has been taken from there). These happen in sequence, first the one then the other. When this happens a demon breaks into Magisrate Chengda’s bed chamber and kills two of his servants but flees when his mother rushes in with a Fu Scroll. The creature leaps through the wall and they see it run toward a sewer entrance. If a demon breaks in again, it steals the baby. This attack will likely result in the death of Magistrate Chengda. The servants would once again witness the creature in question. It would have done its work on anyone who stood in its way and vanished in a cloud of purple smoke when it grabbed the baby. A family of three: Yao Chaoyun, Yao Kwan and Zi (baby). This is originally where the Sword of Time was purchased by Mister Kuo. The entire family is murdered but the baby left alive in its crib. Mother died, slumped in front of crib. Father died wielding an antique sword in front of crip. His heart was ripped out, her throat slashed. Blood on the blankets but baby unharmed. There is a record of having sold the Precious Time Sword to Mister Kuo. Bai Zhun is a profound master from Marauding Plague Sect. He is loyal, aggressive and heartless. Winding the Spiked Chain: Heavy Melee against Evade. Snakes threw up to 15 targets doing 7d10 plus 6 Extra wounds to each person. Blinding Flash of the Spiked Chain: Heavy Melee against Evade. This hits the ground creating an explosion that knocks all back 10 feet, blinds them for 1 round and does 5d10 open damage. These spirited beasts are all in service to Marauding Dragon of the Seven Blood Cave Alliance. They are in the city to find his child and wife. They can assume the form of a bird, a human or a groutesque hybrid. The Bird Demons must eat human hearts regularly for sustenance. They each are named by their coat and type and the leader of the group is Brown Owl. Blue Kingfisher (male): Mean and nasty. Impatient and reckless. Red Minivets, Red Sister and Red Brother: Loyal, precise and aggressive. Rival siblings. Brown Owl (male): Cautious but cruel. Peacock (female): Scholarly, curious and proud. Fire Breath (Kingfisher): Roll against Evade. 7d10 Fire Damage. Dazzle (Peacock): Creates false images of itself (10). Any attempt to attack it has a 1 in 10 chance of being the false image. Fearful Hoot (Owl): The hoot of the Owl Demon causes people to literally shake with fear, imposing a -1d10 Penalty to any skill requiring dexterity or grace. Vanish (Minvet): On a Successful Speed Roll, it can appear and re-appear at will (as a full action). Pecking Beak: The Minivet can rapidly peck up to seven targets at a time. Make a single attack roll. On a Success each peck does 4d10 plus 3 Extra Wounds. Piercing Beak: The Kingfisher can impale several foes at a time in a straight line (up to four people). This does 4d10 plus 5 Extra wounds. Heart Pluck (Peacock): Plows beak into chest cavity into heart. This does 10d10 Open Damage plus it drains 2 Qi. If kill, pluck out heart and devour it. Limb Breaking Beak (Owl): Bird Demons all have powerful Beaks (except the Minivet). On a Total Success it breaks bones that take two weeks to heal. It does 6d10 Damage. Broken arms take -2 Penalty to Parry, -1d10 to Arm Strike, Grapple and cannot use two-handed melee weapon. Broken Legs: -2d10 Penalty to Speed, -1d10 to Leg Strike, Grapple and Athletics. Piercing Wail: The wail of the Vulture Spirit emanates twenty feet and does 2d10 Damage to everyone inside that area. Healing Heart: When they eat a human heart it nourishes them but also heals them by an amount equal to the victim’s Qi Rank. Shape Change: They can take the form of birds, bird-like hybrids and humans. Immunities: Bird Demons are immune to all normal attacks, only taking damage from Kung Fu techniques Qi level 1 or greater.